Primea Beach Residence is a beautiful complex of holiday apartments with beachfront location, which has a clear classical architecture. 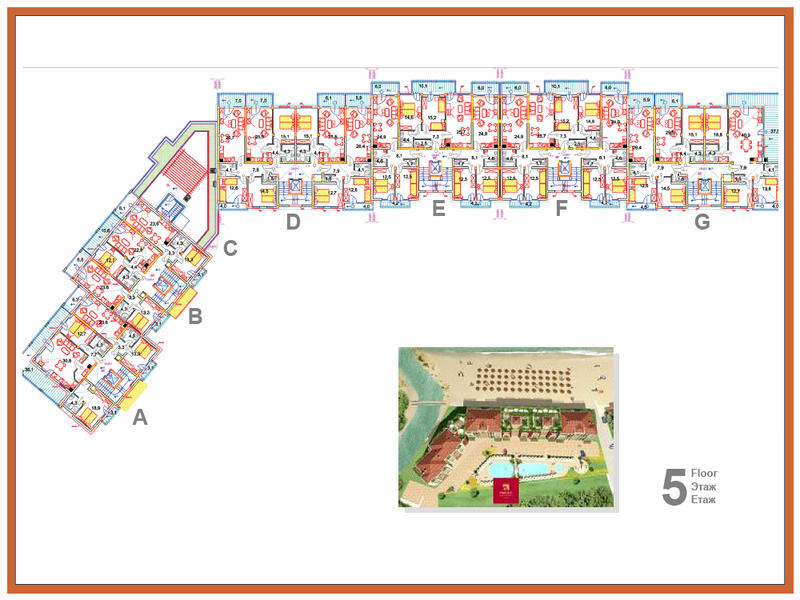 Elegant and well organized, the complex is located in a picturesque area, on the first line of the sea. It isplaced in one of the most peaceful and quiet areas on the southern Black Sea coast, near Nestinarka camping site and is approximately 5 minutes away from the town center of Tsarevo. The complex has a total of 103 apartments, including studios, one and two bedroom apartments, all offering sea and bay views. The holiday apartments enjoy a pleasant decor and are fully furnished and equipped, arranged with air conditioners and many extras. For this reason, Primea Beach Residence complex is ideal for family holidays with children. The complex is completed and has a Permission for usage (Act 16). It was put into operation in August 2009, and for several seasons already meets the owners and their guests. • Construction company with an excellent reputation and numerous built and operating within complexes with apartments, including Premium Spa Residence in Velingrad, Eco Home in Sofia, Paradise Corner 1 & 2 in Plovdiv, Trakia Plaza in Plovdiv. Special furniture package with designer items, on unique individual project. Italian furnishing and flooring, electric appliances model 2013. 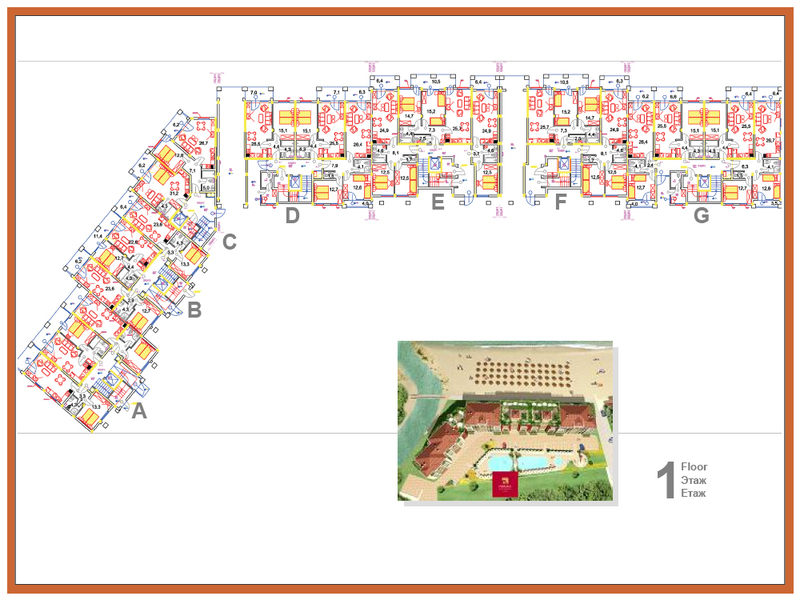 Turn-key completion + air-conditioner, furniture and electric appliances. The rest of the available apartments are offered with turn-key completion, fully completed and ready to be furnished with a bonus air-conditioner. The investors offer professional property management by a registered management company FREE of charge for 2014! All apartments in Primea Beach Residence are offered for sale fully furnished and equipped. The furniture is in the neoclassical style of solid walnut wooden material and is hand made. Each apartment and studio comes fully equipped with air conditioning and LCD TV 32". • The studios are spacious (50 sq.m), all with private bathroom and shower with modern glass partition. They are furnished with a large double bed and a sofa bed. • The one-bedroom apartments (70 sq.m) consist of a separate bedroom and spacious living room with kitchenette equipped with microwave, oven and refrigerator. The living room has a sofa bed. 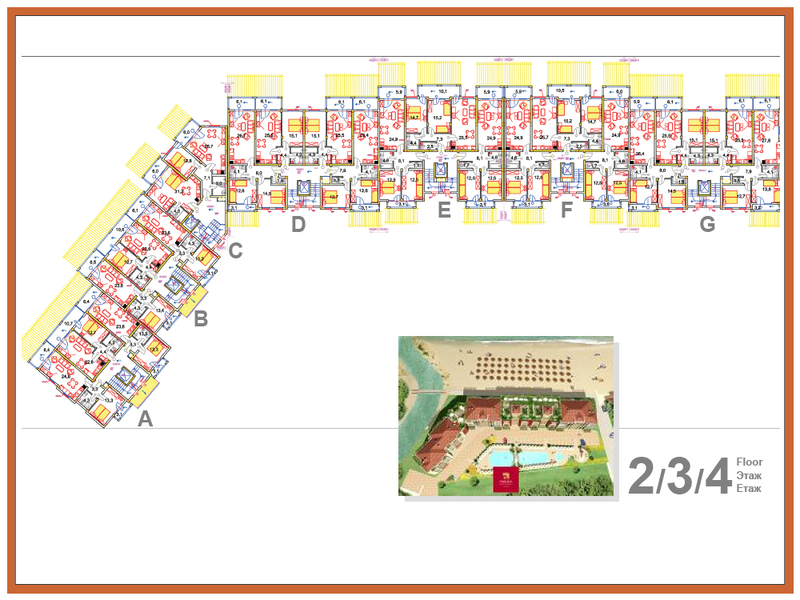 • The two-bedroom apartments (100 sq.m) have two separate bedrooms and a spacious living room with kitchenette. • Foundations of quality concrete, protected by high insulation against moisture and water. • Underground water and drainage system connected to the municipal public network. • Plumbing and electrical systems in accordance with the regulations. Installed switches, plugs and lighting cables. • External walls with thermal insulation. The walls and ceilings of the interior are finished with coarse and fine plaster. The ceilings and walls are painted with latex. • The stairs and entrances of the buildings are finished with tiles. • Swimming pool with separate children's area. • Round the clock security guards. • Landscaping and soft lighting. • Modern elevators in every section. • Kitchen with kitchen cabinets and electric appliances. • Bathroom with shower with modern glass partition. Primea Beach Residence enjoys beachfront location on Nestinarka beach, famous for its fine sand. 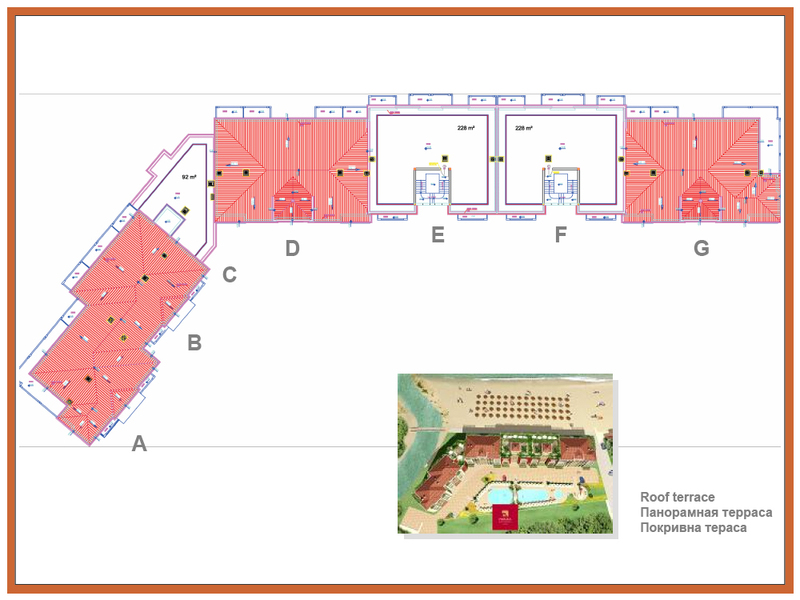 The complex is situated at the bay south of Tsarevo resort and only 65 to 70 km from Bourgas and the airport there. The town is a popular tourist destination in the summer and offers a relaxed, friendly atmosphere. The resort is located on two picturesque peninsulas and is famous as a fishing village and tourist area suitable for family holidays. The city offers many seafood restaurants, charming cafes and small parks. The region enjoys a Mediterranean climate and the longest summer season in Bulgaria. The water is warm and pleasant, and the weather is sunny from early May to late September. The nearest village to the town is Lozenets (10 km), which is a fashionable summer resort, while the romantic and historic town of Sozopol is set only 35 km to the north. The complex is successfully rented to holiday makers for several years already. The apartments can be rented on a hotel basis by a registered management company. Owners shall sign a contract for management and shall pay an annual fee. Apartment complex Primea Beach Residence can be reserved immediately with a non-refundable deposit of 2000 Euro, payable by credit card or by bank transfer. Upon paying the deposit the apartment will be reserved for the period up to the signing of the preliminary contract - within 28 days.